WE HAVE BEEN BREEDING CHIHUAHUAS FOR 6 YEARS, THIS IS OUR BREEDING PROGRAM AND PHILOSOPHY. ALL THE DOGS THAT WE BREED ARE HOUSED INDOORS, RECEIVE REGULAR VETERINARY CARE, AND ARE FED A QUALITY PROFESSIONAL DIET. ALL OF OUR PUPPIES ARE LOVED AND SOCIALIZED AS INDIVIDUALS, WHICH LOWERS THEIR STRESS LEVELS WHEN THEY GO TO THEIR NEW "FOREVER" HOMES AND FAMILIES. WE ONLY BREED CHIHUAHUAS. ALL OUR PUPS RECEIVE AT LEAST THEIR 1ST. SET OF VACCINES, AND ARE DE-WORMED. THEY ARE CKC OR AKC REGISTERED. WE GIVE A ONE YEAR HEALTH GUARANTEE ON ALL OUR PUPPIES AND OFFER A BUY BACK UNDER CERTAIN CIRCUMSTANCES. ALL OUR PUPS LOVE CHILDREN AND BEGIN TO SOCIALIZE WITH THE OTHER LARGER BREEDS OF DOGS IN OUR HOME. WE START ALL OUR PUPS ON PEE PADS AND MOST GO HOME STARTED WITH POTTY TRAINING. EACH PUP LEAVES WITH A BLANKET, TOYS, TREATS AND A SMALL BAG OF FOOD. OUR PUPPIES ARE KEPT WITH THEIR MOTHERS UNTIL THEY ARE AT LEAST 8 TO 10 WEEKS OLD OR OLDER. WE FIND THAT PUPPIES LEFT WITH THEIR MOTHERS LONGER ARE HAPPIER, HAVE BETTER IMMUNE SYSTEMS, DUE TO LESS STRESS AND ARE VERY CONTENT WITH A STRONG SENSE OF SECURITY. 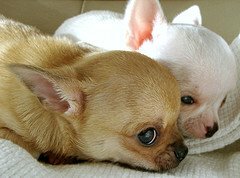 THIS LESS STRESSFUL EARLY BEGINNING FORMS A STRONG BASE FOR THE WONDERFUL PERSONALITY YOU WANT AS YOUR PUPPY MATURES AND THE ADULT COMPANION THE PUPPY WILL BECOME. WE DO SHIP FOR AN ADDITIONAL FEE OF $350.00 (MAY VARY WITH LOCATION) PLUS ANY OVERNIGHT BOARDING REQUIRED. PLEASE LET ME KNOW IF YOU NEED MORE INFORMATION. TAKE CARE AND HAVE AN AWESOME DAY!